The basic principles of Ayurveda can be found in its name, which in Sanskrit means “longevity” (Ayur) and science (veda). Overall, balance within the body is emphasized through moderation of such things as sleep, sexual activity, medicine and last but not least, food. 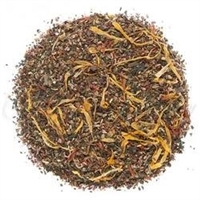 The last, food is an important feature in Ayurvedic practice and as such, all herbs and plants are purported to have various uses and characters. 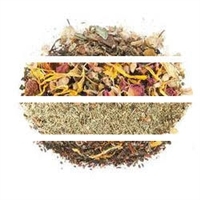 This tea contains Peppermint and Spearmint for their relaxing qualities; Ginger for a spicy layer of vitality; Osmanthus and Hibiscus for a calming aroma; Rooibos for its vitamin rich goodness; Apple and almond for a dash of vitamins; and Rosehip for a floral boost. 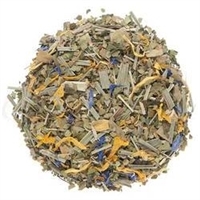 It’s light tart fruity mint opens your palate, floral and fruit follow and finishes with ginger. Life goodness in a cup. NOTE: Contains nuts. 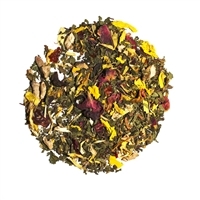 Luxury ingredients: Rooibos, Peppermint & Spearmint leaves, Rosehip & Almond & Apple pieces, Ginger, Hibiscus & Rose & Sunflower & Calendula & Osmanthus petals and Natural flavors.